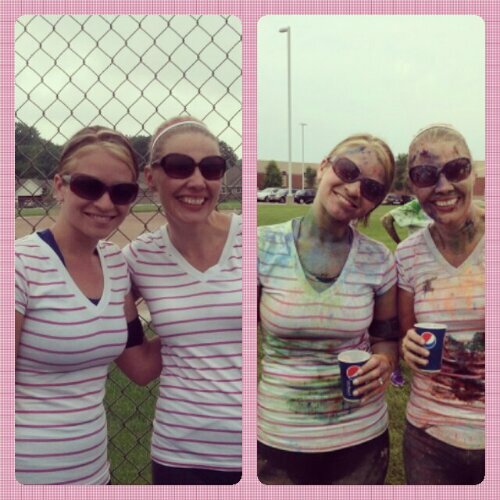 As many of you know, my second bestie, Nikki and I ran in the KZ Kiss FM/Kolour Shuffle 5k on Saturday. Let me just tell you, it was a BLAST! As we drove over 100 miles to do this, the sky kept getting darker and we thought we were going to end up running in a rainstorm. Luckily, the weather held out! The course was completely waterlogged and muddy, which made for some slippery conditions. The event was non timed, and according to Nikki’s Map My Run app, over 4 miles 🙂 I love that I have absolutely no idea what our finish time was, made it all the more fun! 1. Wear sunglasses or other protective eyewear. You don’t want this stuff in your eyes! A sweatband would help too, it’s a little stingy when mixed with sweat and dripping in your eyes. 2. Close your mouth when running through the color stations! Yuck! 3. Do not wear anything you wish to keep clean. The color will wash out, but you just never know! 4. Leave your cell phone and/or GPS watch at home (or with your clean friend, in our case!). If you run with your watch in an armband, the band will get yucky and your phone will end up with colored powder all over it. 5. Do NOT wear your best running shoes! 6. Bring towels to sit on in the car on your way home! Thanks, Nik! A change of clothes would also work. 7. Prepare to have a blast! Any other Color Run tips to share? Great tips! The only thing I would add is make sure you take a friend and have a blast! Wow! I’d never heard of color runs before reading your review but they sound like great fun. I’ve just googled it and they’ve just started doing them in the UK woohoo! I’ll have to check them out thanks for the review!